Woman-owned distributor of standard & custom remediation equipment & systems for soil, water & groundwater remediation. Remediation equipment include air strippers, oil & water separators, pilot test units, storage tanks, pneumatic groundwater pumps, electric groundwater pumps, transfer pumps, etc. Manufacturer of groundwater remediation equipment such as evaporation distillers. Two water-recycling evaporator models available: low-pressure steam system with capacity ranging from 25 to 2400 GPH; mechanical vapor recompression unit with capacity ranging from 50 to 1000 GPH. Manufacturer of ground treatment & remediation systems & equipment including ozone water purification systems. Eliminates contaminants such as bacteria, protozoa, algae & viruses, reduces mechanical problems & removes offensive colors, odors & tastes. 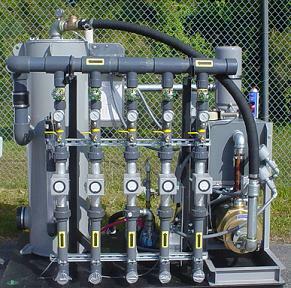 Custom manufacturer of groundwater remediation equipment including mechanical vapor compression evaporators also suitable for oily water coolants & lubricants, wash & rinse waters, high TDS solutions & salt, sea & brackish waters. Manufacturer of water treatment equipment including groundwater remediation equipment . Product line includes above & below ground oil/water separators & hopper separators for the removal of free & dispersed non-emulsified oil & settleable solids from waste streams. Design & manufacture of wastewater evaporators for wastewater minimization generated in groundwater remediation processes. Specializes in production style, off-the-shelf equipment. Manufacturer of water treatment products & systems for arsenic removal, iron & manganese removal, hydrogen sulfate removal & ground water uranium removal. Products include pre-engineered packaged, skid-mounted systems residential point-of-entry systems (POE) & point of use systems. Manufacturer & distributor of pollution control equipment for use in groundwater applications. Manufacturer of ozone generators, turnkey systems & OEM products. Design/build turnkey package ozone sparing systems. Manufacturer of reusable & disposable ground water bailers. Available in 46 OD up to 4.5 OD lengths 1 in. up to 10 in. PVC, stainless, Teflon®, poly, Teflon®cable & cord, reels. ISO 9001:2000 certified custom manufacturer of groundwater remediation equipment including dewatering pumps made from steel. Specifications of dewatering pumps include 4 in., 6 in. & 8 in. size, 47 gal., 87 gal. & 93 gal. capacity, 10 in. fuel frame, 67.7 hp maximum power & 110 cfm, 167 cfm. Manufacturer of groundwater remediation equipment , wastewater filters, filter cloth & media for screening applications in water & environmental markets. Manufacturer & Distributor Of Remediation & Wastewater Systems. Manufacturer & distributor of groundwater remediation equipment & treatment systems.